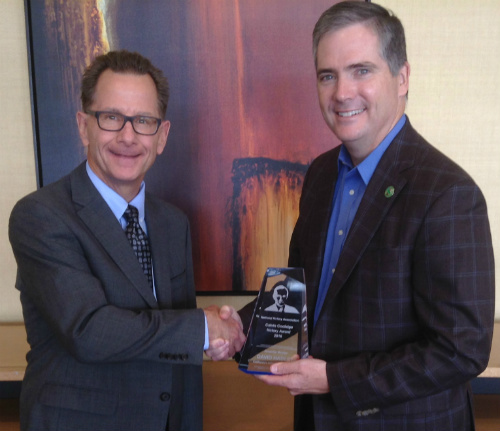 The National Notary Association (NNA) honored California State Assembly Member David Hadley (R-66) with its Calvin Coolidge Notary Award for his leadership and ongoing commitment to the State’s 163,000 Notaries. Hadley authored Assembly Bill 2217, which increases the maximum fees Notaries can charge after January 1st, 2017, because he believes Notaries should be treated like other professional service providers and be allowed to set their own prices. The fee cap was raised by 50 percent, from $10 to $15 for most notarial acts, making it easier for Notaries to cover the ever increasing costs of maintaining their commission and providing vital services that the public needs. “I’m honored to receive this award from the NNA and I’m proud of the work we’re doing here in California to support people who have small businesses. I’ve often needed Notary services and after learning that Notaries maximum fees hadn’t changed in two decades but the Consumer Price Index went up more than 50 percent, it became clear that an increase was long overdue,” said Assembly Member David Hadley. "Notaries should have more freedom to set their prices like other professional service providers." The Award was presented to Hadley in Torrance, Calif. in front of an audience studying to become Notaries. The Calvin Coolidge Notary Award was established in 2004 to honor public officials whose dedication and accomplishments result in significant progressive change for Notaries. The Award is named after President Coolidge because his commitment to public service, his integrity and his impartiality set the example to which every Notary should aspire. Previous Calvin Coolidge Notary Award recipients include West Virginia Secretary of State Natalie Tennant (2015), Rhode Island Governor Donald Carcieri (2009), Rhode Island Secretary of State Ralph Mollis (2009), Philadelphina Commissioner of Records Joan Decker (2008), Lancaster County Pennsylvania Recorder of Deeds (2008), New Mexico Secretary of State Rebecca Vigil-Giron (2005), New Hampshire State Representative Cynthia Dokmo (2005) and Missouri Secretary of State Matt Blunt (2004). Established in 1957, the National Notary Association (NNA) is the leading professional authority on the American Notary office and is dedicated to educating, serving and advocating for the nation’s 4.4 million notaries. It published the Model Notary Act to help lawmakers enact effective legislation and created The Notary Public Code of Professional Responsibility, a standard for best practices and professional conduct. To learn more, visit NationalNotary.org.